Does everyone know what a GWP stands for? I only found out about a year ago despite having been a regular owner of them for ooooooooooh about 10 years? I think infact that I may have been the last person in the world to discover what the acronym actually stood for. Kinda like that time I discovered my ex was sleeping with someone that wasn’t me. 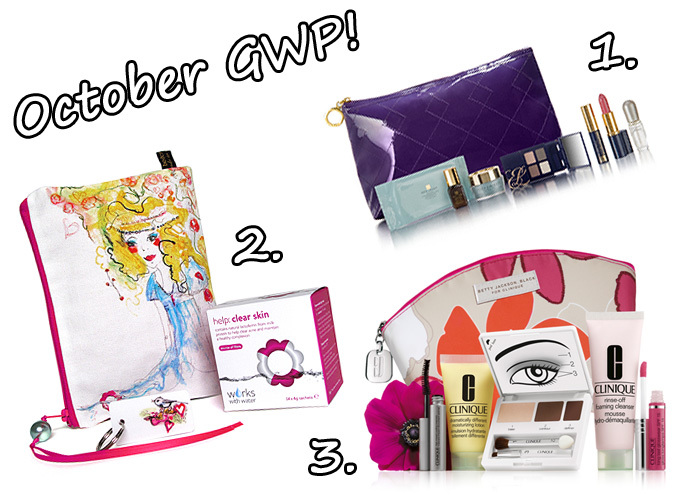 GWP = Gift with Purchase! Some brands are pretty famous for their awesome GWPs and many shoppers time their repurchases to coincide with instore events that feature these lovely little extras! With potential bargainous Christmas pressies in mind, I contacted a few brands to find out what they had to offer for the month of October and was pleasantly surprised to find some not too shabby offerings! Free with any two or more Estée Lauder purchases. As for the Clinique gift, I got mine, it’s lovvvvely, may even blog about it (when I recover from this nasty cold). Thanks! I hate Clinique’s GWP offers though as it’s always 2 purchases one must be skincare! It bugs me because I don’t buy their skincare, but do occasionally get make up from them, so can never use the GWP offer. The Clinique’s GWP looks really interesting! Thanks for sharing this information. Meh, around here there are almost no GWP (I did see two on Bourjois a few years ago, a nice tin and a shower gel, and profited from them). Also: I love your blog and just subscribed it via email! the best thing when buying items are that they comes with freebies and more GWPs!!! Well, i am ignorant too and never knew what it meant. I guess that little gorgeous ‘velvet’ palette when you buy that green bottle of mascara is a GWP, then, right?